I love my hat so very much. Take a look at that face. That’s foster dog Mia. She loves that hat so very much. She came to live with us when a cousin decided to take a year long trip around the world. (think mostly Asia and South America) In the 13 or so months that she’s been with us, she’s learned to love snow, kill voles, chase chipmunks, annoy her 15 year old doggie second cousin Stitch, and generally snuggle her way into our hearts. She lectures us when we’ve been gone too long, insists on playing squeaky football before breakfast, and has carved out a permanent spot between my husband’s calves when he reclines in his favorite chair. I’ll probably post more photos and videos as I ready myself to let go. Tell me about your fur babies in the comments below. That might help me overcome my sorrow. 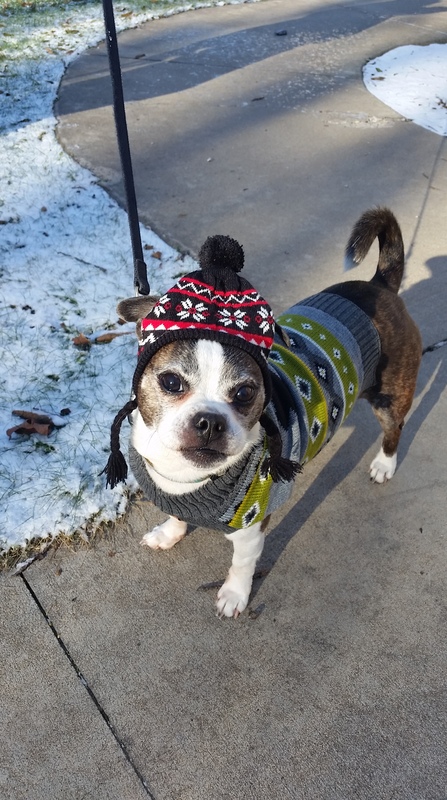 This entry was posted in Critters and tagged cute dog in hat, doggie personality, editing, foster dog, I love my dog, June Nash Mystery, Melissa Banczak author, squeaky football, writing. Bookmark the permalink. I know you’re letting Mia take that fabulous outfit home! Best thing about this story—–it has a HAPPY ending. Fosterdog had a blast at your house, and now she’s going home to more family! More pictures,please! Snuggling here in the snow (finally!) with the remaining pack. Christmas wasn’t the same without my dog Kane, but I know he’s in a much better place! Oh no, did you lose him this year? It’s so gut wrenching to lose our furry loves. We’ve been lucky in that our pups have lived very long lives. It always seems to be cancer at the end. Though we lost our beloved lab to an autoimmune disease that the vet could never pin down. I still sing silly songs about her to the other pups. Hmmm. I sound like I’m giving the crazy cat lady persona a workout. Did you try to post a photo? I’m not sure if people actually can in these comment pages. Sept. 20 I had to put him to sleep. Kane was 10 yr old German Shepherd. I’ve had 4 GSDs, all rescues but one! He had been beaten and crated for 4 yrs, but had 6 years of love from me!! He started having seizures and was on phenobarb 3 times a day. On that Sunday he had one that left him almost paralyzed so I had to make that call to the emergency vet and sent him to his final peace. They were so knd and compassionate. I never left his side and I’ll always be grateful for the memory of him passing so peacefully. Not ready for another, yet! Give Mia a big hug and kiss from me!! I’m glad you could be with him. When we had to put down my Greyhound (she suffered from a paralyzed larynx) I couldn’t get away from work but my husband was able to be with her. Take your time to grieve.Well, now I need caffeine and a tissue.